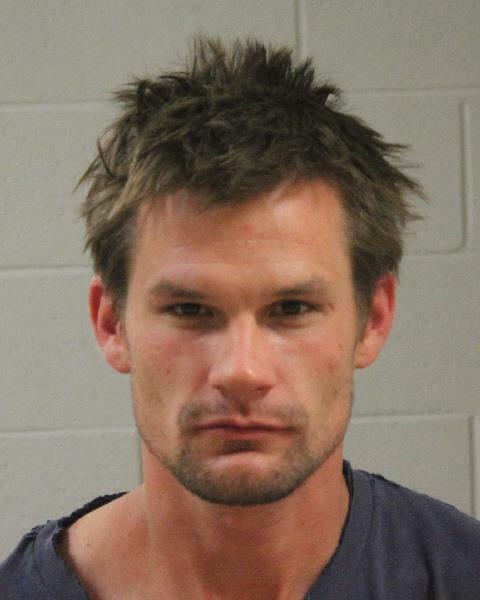 ST. GEORGE – A high-speed chase, which began after authorities spotted a stolen vehicle speeding on Interstate 15 Tuesday evening, ended in Hurricane with the arrest of a 31-year-old Hurricane man. While traveling south on I-15, near milepost 20 just south of Leeds, in a marked patrol truck, Utah State Parks Officer Jacob Hinton observed a black passenger sedan traveling past him at a high rate of speed, according to a probable cause statement Hinton wrote in support of the arrest. When Hinton ran the vehicle’s license plate, it came back as stolen out of Pleasant Grove. The vehicle continued traveling south before transitioning off I-15 at Hurricane Exit 16 and heading east on state Route 9. When Hinton attempted to stop the vehicle near milepost 3 on SR-9, the driver, later identified as Daniel Scott Palmer, stuck his index finger out the window and flipped Hinton off, according to the probable cause statement. Hinton continued to attempt to pull the vehicle over. As the pursuit continued, Palmer moved to the right shoulder of the road and off the roadway and then sped off, traveling at approximately 90 mph, the statement said. The chase continued on until it reached Interstate Rock Products, located at 42 S. 850 West in Hurricane, at which point, Hinton said in his statement, he lost visual of the vehicle, turned off his light and siren, and terminated the pursuit. However, as he turned around, a group of workers in the area told him the driver of the vehicle was running west towards the exit of the Interstate Rock Products property. Hinton spotted Palmer running west before hiding behind an orange fork lift, his statement said. Hinton got out of his vehicle and yelled “police, show me your hands – get on the ground.” Palmer showed Hinton his hands, but did not get on the ground. Hinton then told Palmer again to get on the ground, and Palmer went down on two knees, the statement said, but when Hinton approached Palmer, he stood back up and took off running again. “I caught up to Palmer and went hands on with him and took him to the ground,” Hinton said in the statement. By this time, a Utah Highway Patrol trooper arrived followed by a Hurricane City Police officer. While Palmer was detained, authorities went back to where the car was ditched and confirmed the vehicle was stolen, according to the statement of probable cause. Palmer was arrested and booked into the Washington County Purgatory Correctional Facility. He was charged with a second-degree felony for theft by receiving stolen property, a third-degree felony for failing to stop at the command of police, and a class A misdemeanor for failing to stop at the command of law enforcement. His cash-only bail for his release pending trial stands at $20,000. He is scheduled to make his initial court appearance on Thursday. Check out that cocky mugshot. This guy thinks he’s awesome. I bet he was sad when his designer jeans got dust on them when the officer took him down. So what he flipped off a cop.. big deal who cares. The Supreme Court said flipping off a cop is protected under freedom of speech. out of all the stuff that was taking place you chose to focus on him flipping off a cop…?